I really hadn’t planned on blogging today. But sometimes life doesn’t go as scheduled. Last evening, my husband, Russell was excited. Excited, because he was cooking up a pot of my mom’s homemade chili with his super-secret spicy ingredients for the at&t Chili Cookoff in Bridgeton, Missouri. Granted, an argument almost ensued (a time or two) during the cooking process. “Does the chili need something else added to it,” he asked. A little more cumin, a pinch more red repper, a dash of cinnamon, and chili powder to boot! “Okay, now taste it,” he said. As I lifted the spoon to my lips and sampled the savory sustenance, I felt a ‘slow burn’ on the trip from tongue to my tummy. “It needs more heat,” he commanded. As I stirred the large stockpot full of meat, beans, and sauce, he chopped the ‘secret ingredient’ and added it to the mix. “Too hot for me,” I commented. With chili refrigerated, and the dishes clean, it was time for bed. This morning, after loading up the Silverado with the crockpot, and a quick goodbye kiss for his better half, Russell was on his way. Within a few minutes, my cell phone rang with the song, “Hey, hey, good-looking.” I sensed something wrong – problems with the truck. Even worse, the crockpot toppled over. “Open, the *#@&% * garage door!” he yelled. I waited patiently (as sometimes wives do) inside. Hearing footsteps on the concrete floor of the garage, I opened the door. Sensing his frustration, quickly, I rinsed the lid and wiped the sides of the crock. I took my personal stash from last night out of the frig, and added it to the chili and 6 ounces of water to thin it out. As I glanced over at him, I noticed a familiar look on his face. He was bummed out. Upon entering the house again, I could tell his mood had lifted. “It’s in my speakers!” he laughed. “Honey, you really need to tape that lid down,” I suggested. With duct tape in hand, Russell was taking no chances. 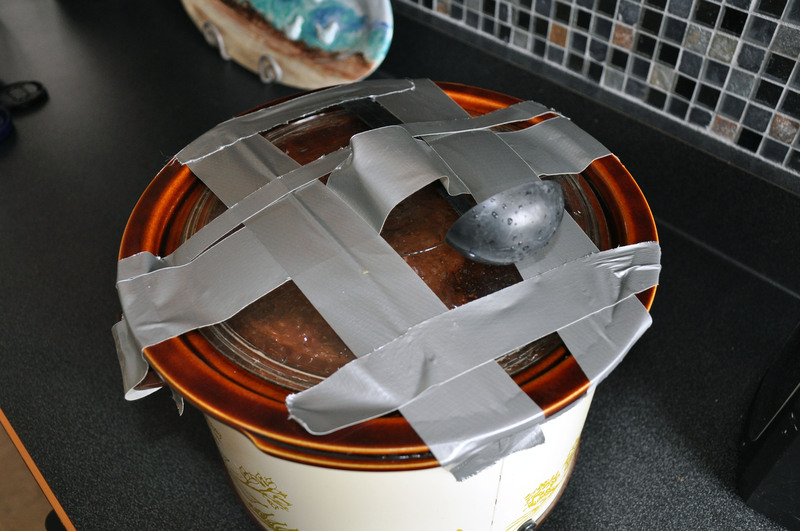 He proceeded to tape the glass lid to the crock with distinct precision. I slid a ladle under the tape to help him out. I grabbed the Nikon and took a pic of the crockpot with its new silver bling. In a flash, he was out the door again, carrying the ‘secured’ chili. Sometimes, when life gives you spilled chili, you just have to go on and figure out a new recipe for life. This entry was posted in Fabulous Food, General, People, Photos, Things That Make You Think and tagged at&t, beans, chili, cookoff, crockpots, food, German, Lithuanian, mom's home cooking, receipe for life, recipe by shereenielsen. Bookmark the permalink.